As a group, our mission is to design and implement an aquaponics system on campus in order to raise awareness about sustainability, zero-waste environments, and green technologies. Aquaponics is a sustainable food production system that combines aquaculture (aquatic animals such as fish) with hydroponics (growing crops in water) in a symbiotic environment. The water from the fish tank gets pumped up to the hydroponic grow-bed, where it is filtered by the plants and dumped back into the fish tank. The ESW Aquaponics team's goal is to implement aquaponics systems at several locations on campus to spread awareness about sustainable food production methods and to get students interested in environmental issues. After a year of hard work and persistence, our team is finally able to build a system in the Biology Field Station! The Station is located behind the Campus Services Complex, to the east of Warren College. We're building our large system here in order to experiment with and perfect the environment for the life in our system. We are also working on a project in coalition with the Food Co-Op on campus, which is located in the Old Student Center. We are currently in the works to build a mobile system for the Co-Op, in the hopes that people become interested in aquaponics and other environmentally-friendly ways to make food. Our goal is to complete this system by the end of this quarter, Winter 2012! 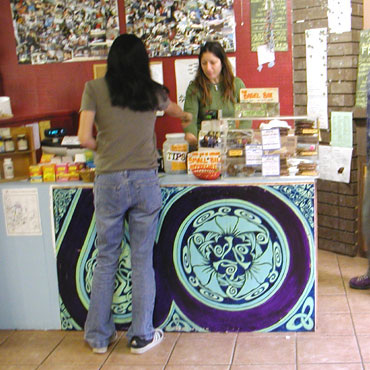 The Food Co-Op is a great place to go for organic vegetarian- and vegan-friendly food. 1/29/2012: Ben and Grace have gotten all the supplies to build the system! We've sent a Doodle poll out if you want to get involved in the building stage. My e-mail is at the top of this page, along with Ben's. 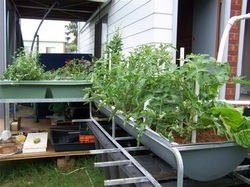 2/7/2012: Ben, Grace, Jeff, Nicole, and Tim have attached the grow-bed to the cart. Special thanks to Daniel Nguyen for giving us advice on our system! 2/22/2012: The team brought out the system to Enspire, a student-run outreach event designed to introduce middle-school students to university-level engineering.